Ruins of a Bronze and Iron age site, on a hill in the entrance to the Hilazon creek, within the "land of Cabul". 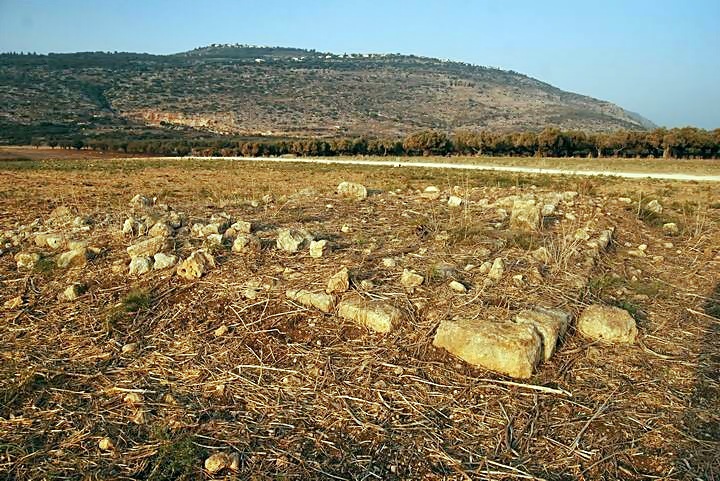 It may be identified as the Biblical city of Ne'iel. Ruins of a Bronze and Iron age site, on the Ya'anin hill in the entrance to the Chilazon creek . It may be identified as the Biblical city of Ne'iel (in Hebrew it means: "moved by God"). This city was probably one of the cities within the area called the "land of Cabul", which were traded to the Phoenicians by King Solomon. The site is located on a steep hill (67M) in the mouth of the Hilazon (Chilazon) creek (which is at about 25M height). It is easily accessed by a dirt road from the turn of the road to Sha'ab (marked on the map as "enter here"). The map below shows the Tell Ya'anin in the center and other sites nearby. You can point on the purple points to navigate to the selected site. The site was a walled city in the Bronze and Iron ages. The city may have been surrounded by water, at least on its north side, since the Chilazon creek is located 100M to its foothills. The city situated on an ancient trade route from Acre (Akko) and Via Maris (the north-south coastal highway) towards the center of the Galilee and further to the east. The ancient route passed near the city, then along the Chilazon and Ne'iel creeks. 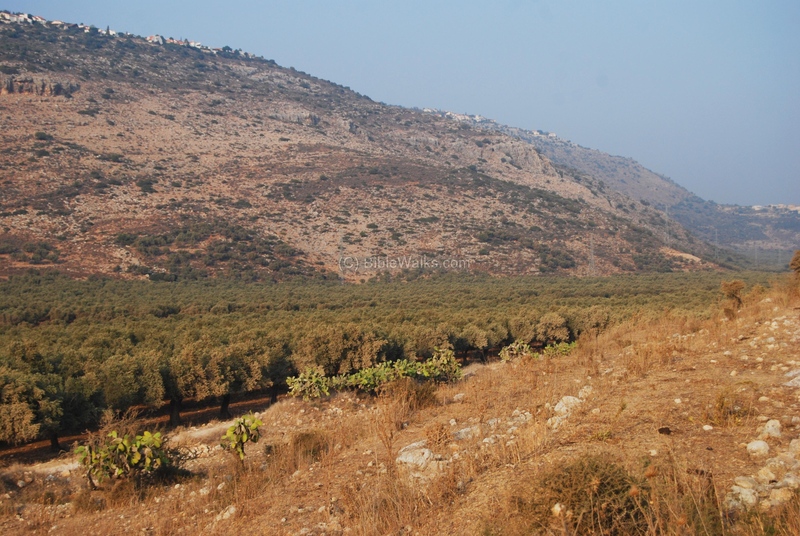 This route also allowed the villages and cities in the center of the Galilee to market their products. 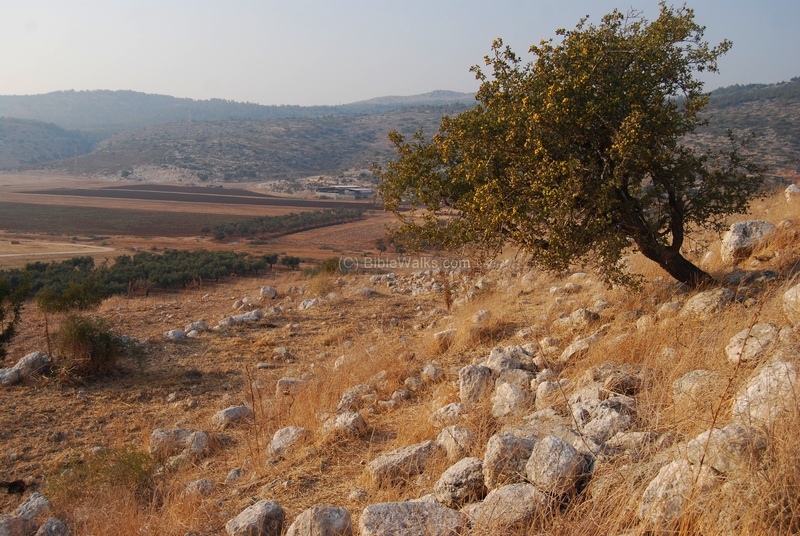 The ancient city is identified by scholars as the Biblical city of Ne'iel, which was mentioned in the region of the tribe of Asher (Joshua). An alternative name was "Neah", mentioned as part of the boundaries of the neighboring Zebulun tribe. Both names may relate to the same city, and its name was preserved in the Arabic name of the site - Ya'anin. Since it probably have belonged to the "land of Cabul", it was given by king Solomon to Hiram King of Tyre as exchange for his assistance in building the temple (Kings). The region of the tribe was probably relocated to the east to compensate on the loss of the area. The city was probably destroyed by the Assyrians in the 8th C BC (734-732), after the intrusion Tiglath-Pileser III (Kings II 15: 29). 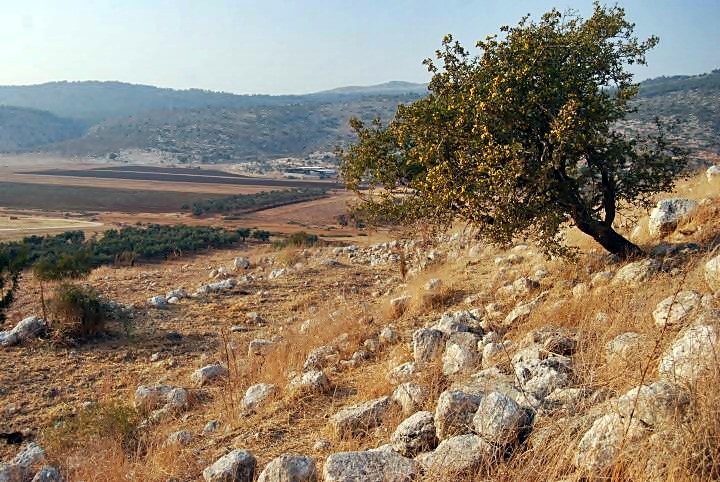 This intrusion wiped out most of the Galilean sites, as written in the Bible, and it was never inhabited again. 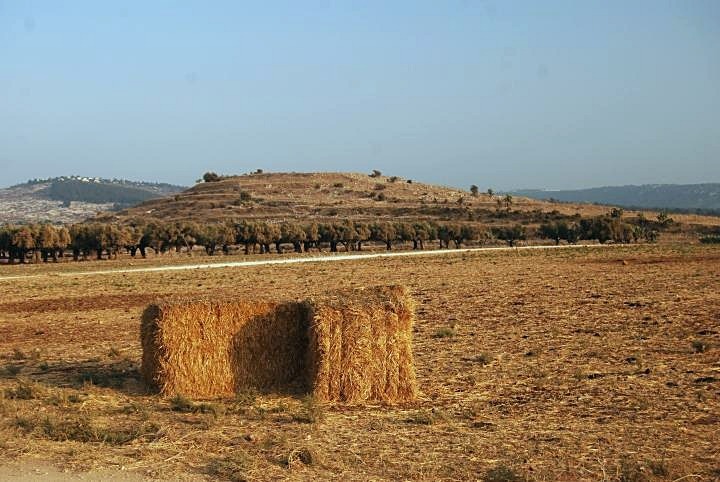 It was abandoned and new, larger sites, were established during the following prosperous Hellenistic and Roman periods, in the nearby new villages: Sha'av (Sa'ab) (2KM to the east) and Khirbet Beza (2KM to the south-east). The site is in ruins and not excavated, with few visible structures. 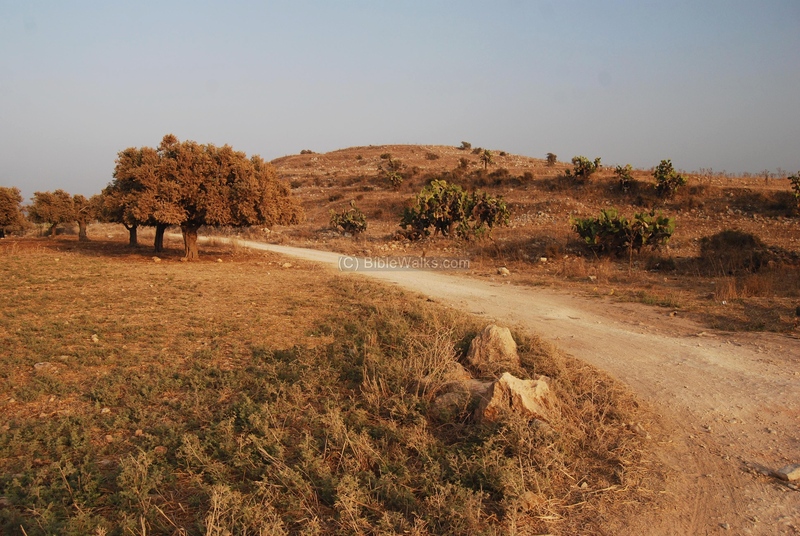 The area around it is still undeveloped and the view still remains "Biblical". However, a new industrial zone and development on the north hills are already changing the landscape, and unfortunately this special atmosphere will change in the near future. This view was captured by a quadcopter drone, 100m above the south side of Tell Ya'anin. The photo was taken in late December, and at that time the hill is covered by weeds. Later in the spring, and throughout the summer and fall, the green turns to brown and yellow. Traces of the ancient structures are seen close on the summit and on the upper level of the foothills. Behind the hill is the valley of the Hilazon stream. 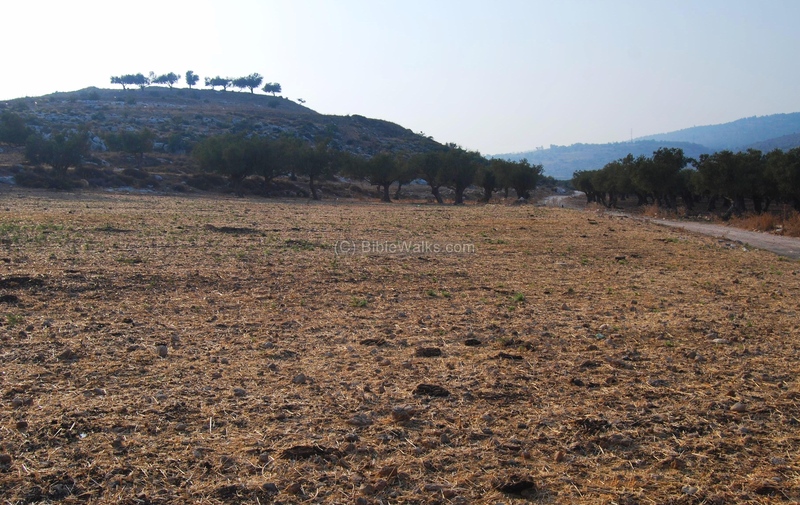 The next photo is a ground view of the site, as seen from the east side, close to the modern road to Sha'ab. 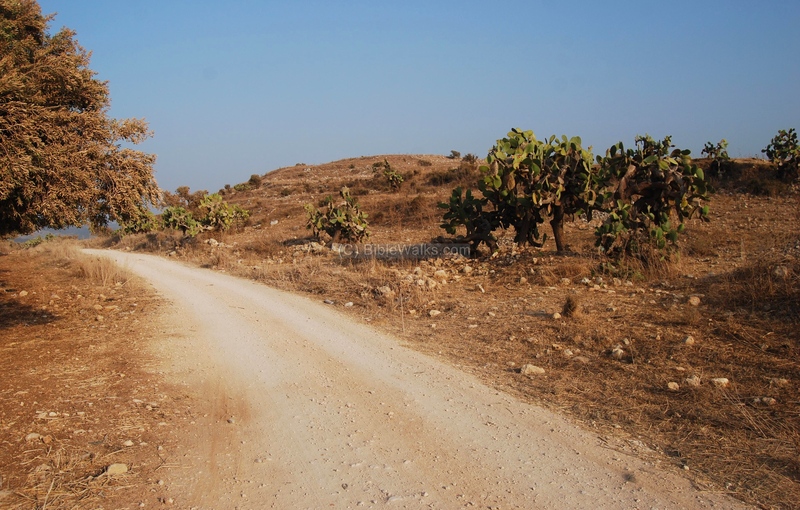 The dirt road on the right is located on the path of the ancient trade route that passed the Tell on its north side, and continued towards Acre. The same road is also seen from the west side of the Tell, which is about 40M higher. Along the road are cactus bushes that once were used as fences along the road. 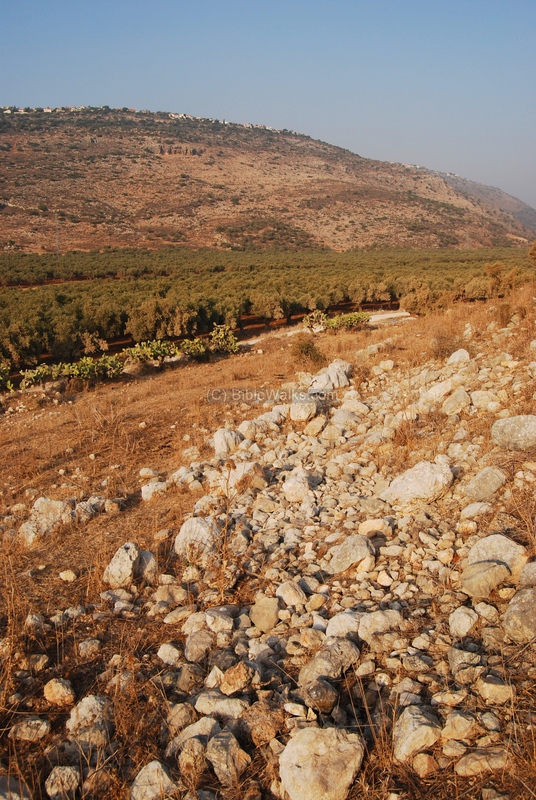 On the way to the summit, there is a spectacular view of the olive groves along the Chilazon creek. At the end of the summer the creek is dry, as well as most of the vegetation on the hill. 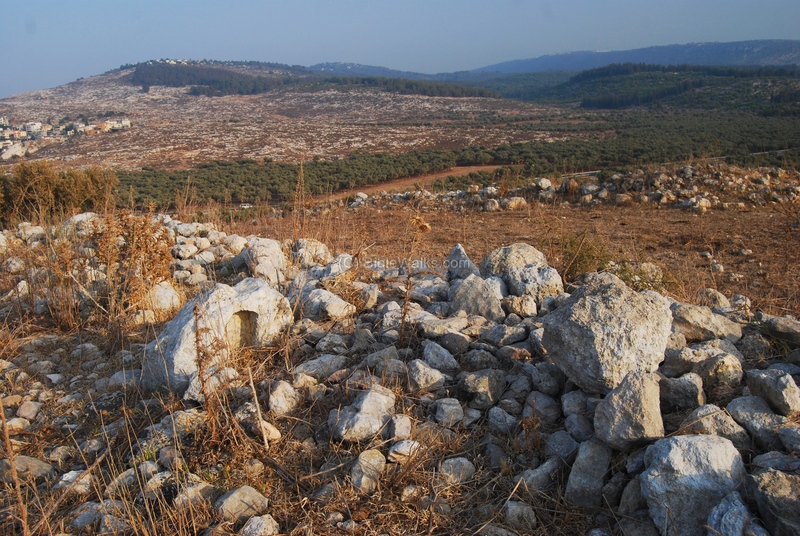 The foothills are covered by ruins of the walls and houses that once were part of the Bronze/Iron age city. The photo below shows a view from the west side of the hill. A closer view of the north-western side of the hill is seen below. The photo below shows the western foothills of the site, with traces of the ruins of its walls and houses. 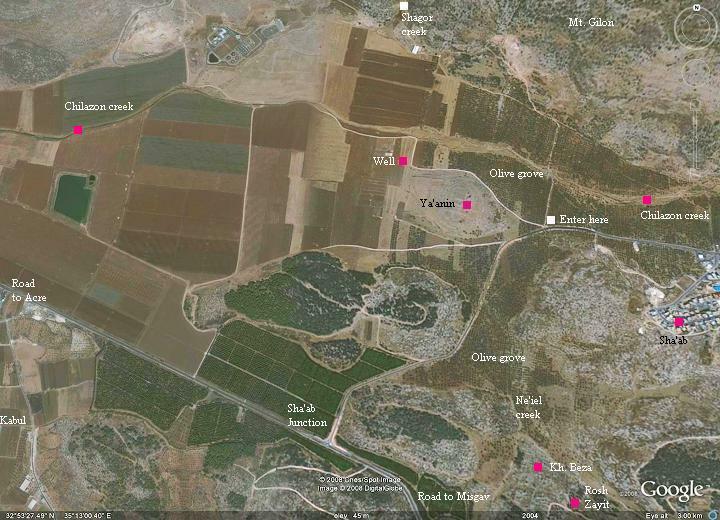 The valley on the far left side is called Shegor, which drains the large valley of Carmiel (Beit Hakerem). It is a popular hiking path along its deep gorge. The summit of the hill is flat, its size is about 100M by 100M. On the summit are traces of ruins and possibly fragments of an olive press. The view from the top is fantastic and worth the steep climb up the hill. The photo below shows a view towards the east. 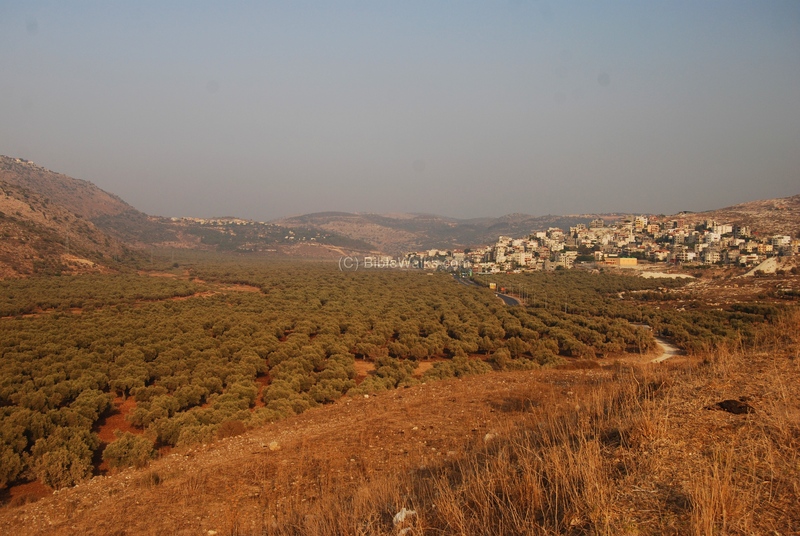 The villages that are seen in the background include: the Arab village of Sha'ab (on the left), the Jewish settlements of Ya'ad (on the top of the left peak), Atzmon/Segev (on the peak in the far center), and other Misgav settlements (on the far right background). A green hill on the right is the site of Rosh Zayit (a Phoenician fortress and village dated to the 11th through 8th C BC) and Khirbet Beza (a Roman village). The ruins of a well is located in the valley on the north-west side of the hill. It once served the city and the trade route. The base of the well is seen in the photo below. Another view of the ruins of the Ya'anin well, from the south-west side. The modern settlements of Gilon and Tzurit are seen on the hill above the creek. There are many cactus bushes on the hill and around it. A closer look on the cactus fruits. This bush is located on the north side, along the road. 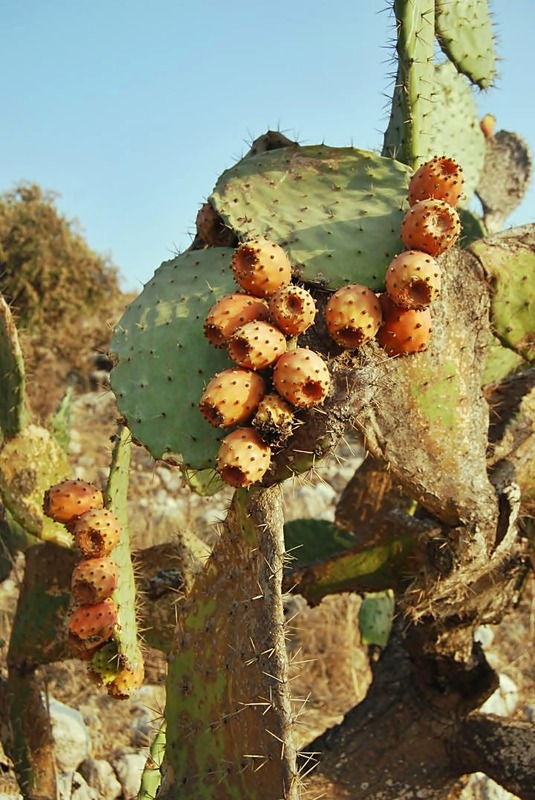 The cactus plants are common in such sites - they were used as fences and were also planted along the sides of the roads. 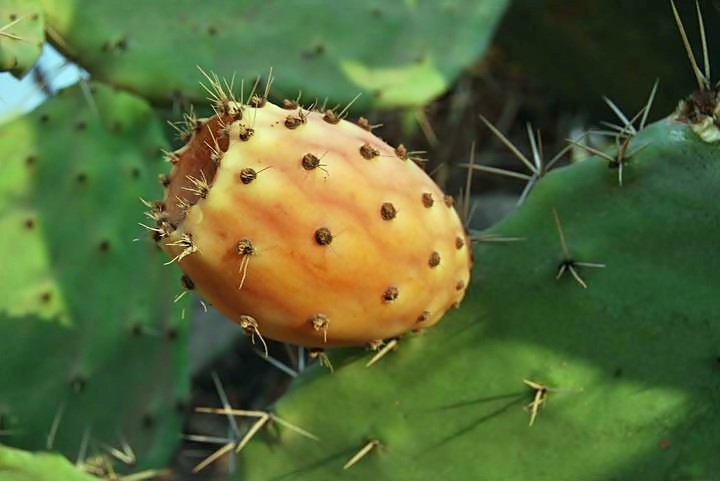 Another closer view of the fruit. 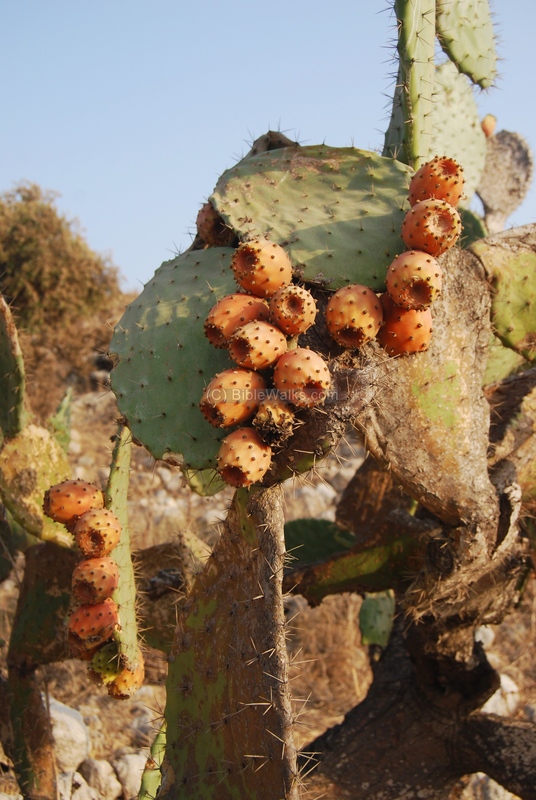 During the end of the summer you can pick these sweet fruits (Sabre)- but beware of these tiny thorns. 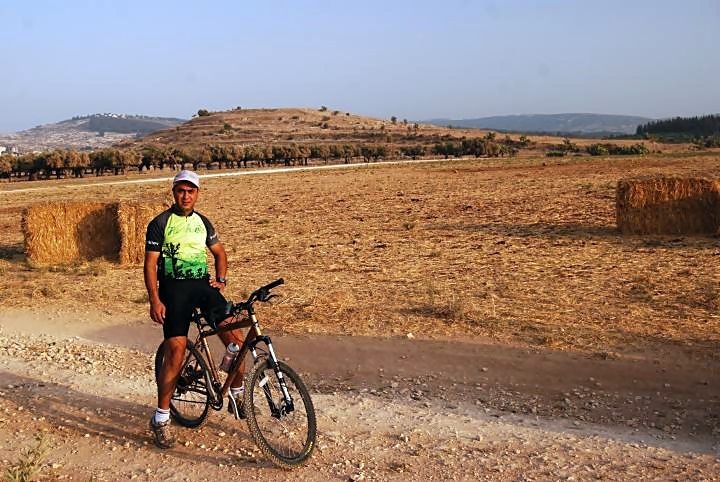 When we visited the site, a mountain biker came along the road. 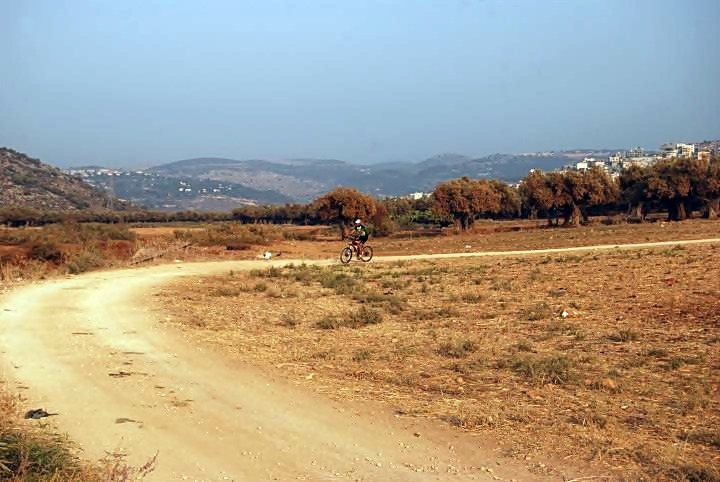 This road is part of the Chilazon creek bike trail, which reaches Karmi'el (passing by Khirbet Fachir where we spotted another biker). This biker is from the village of Sha'ab, and rides about 15KM to the highway and back. Sha'ab is an Arab village 2KM to the east of Ya'nin/Neiel. The name means in Arabic: gorge. 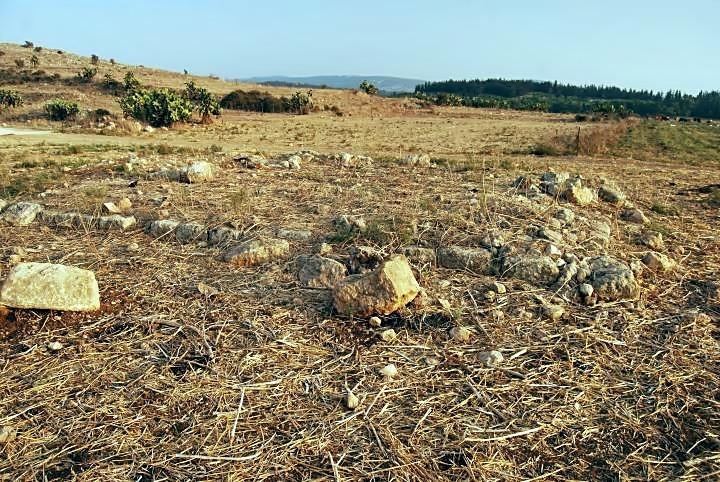 It is located on the ruins of a Roman/Byzantine Jewish village by the name of Sha'av (which means to pump water), and it preserved the ancient name. Book 3, chapter 7, 21: "And here a certain Jew appeared worthy of our relation and commendation; he was the son of Sameas, and was called Eleazar, and was born at Saab, in Galilee. This man took up a stone of a vast bigness, and threw it down from the wall upon the ram, and this with so great a force, that it broke off the head of the engine. He also leaped down, and took up the head of the ram from the midst of them, and without any concern carried it to the top of the wall, and this while he stood as a fit mark to he pelted by all his enemies. Accordingly, he received the strokes upon his naked body, and was wounded with five darts; nor did he mind any of them while he went up to the top of the wall, where he stood in the sight of them all, as an instance of the greatest boldness; after which he drew himself on a heap with his wounds upon him, and fell down together with the head of the ram". The village of Sha'ab is seen on the right, while Shorashim is on the far left side. This text tells about the boundaries of the Asher tribe, which included the city of Ne'iel. Note that "out to Cabul on the left hand" means to the boundary went out north to the city of Cabul or to the north of the Cabul land. This text tells about the boundaries of the Zebulun tribe, which included the city of Neah. Neah may be another name for Ne'iel. This text tells about the Solomon-Hiram agreement, where the area of west Galilee (land of Kavul/Cabul) was traded with the Phoenicians. The implied reason was that King Solomon had to pay for his debts (to pay the cost of the timber, labor and other goods), and he paid with prime real estate (although Hiram was not pleased as per the Biblical text). 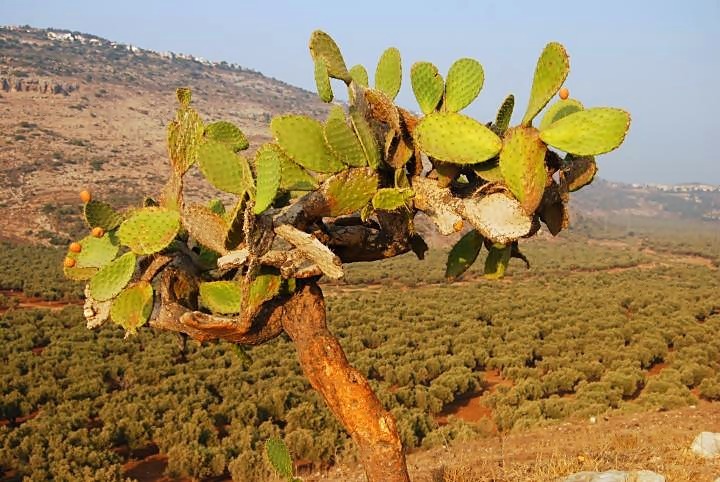 Actually, this old treaty lasted for 3000 years until Israel was founded, since the area of west Galilee always remained under the Phoenician control. "Now Hiram the king of Tyre had furnished Solomon with cedar-trees and cypress-trees, and with gold, according to all his desire--that then king Solomon gave Hiram twenty cities in the land of Galilee. And Hiram came out from Tyre to see the cities which Solomon had given him: and they pleased him not. And he said: 'What cities are these which thou hast given me, my brother?' And they were called the land of Cabul, unto this day". Ne'iel - The suffix in Hebrew El means "God". The prefix may come from the root word Na - which means "move". Therefore the name may mean "moved by God". Ne'ah - another possible name of the city, and may mean the same. The suffix "ah" also can mean "God". Kavul (Chabulon, Zabulon, Cabul) - In Hebrew, a muddy soil which is found in swamps, and is a deposit of decaying plants in swamps. Chilazon (Khilazon, Hilazon) - name of the creek that flows near the Tell. In Hebrew: snail; named after the purple color manufacturing industry that was based on the snail. It also implies a winding form of the creek. Sha'ab - the Arab village near Ya'nin/Neiel. The name means in Arabic: gorge. Sha'av the Roman village that preceded Sha'ab. The name means in Hebrew: pump water. Is this the location Biblical Cabul? 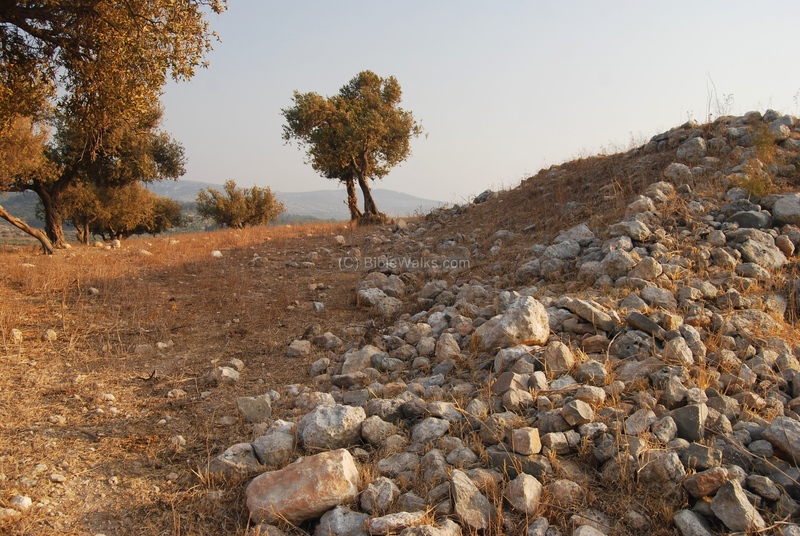 This site has a Bronze and Iron age level, so it may be the Biblical Cabul or one of its twenty cities. Lower Galilee in 8th to 6th C BC Israel Antiquities (article in Hebrew); includes a history of lower Galilee and recent surveys of the area. P2k Trail -35km route along Hilazon creek that combines an urban and nature reserve, uniquely designed for families and professional riders. "Fly" over the mound with this Youtube video.